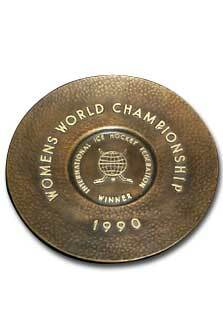 The Women's World Championship is a relatively new event, having staged its first competition in 1990. This tournament, initially held every two years, grew in stature that precipitated not only the need for an annual tournament but also separate tiers to accommodate additional competing nations. While there have always been eight to nine teams vying for women's hockey supremacy, every gold medal game has featured the two perennial powerhouse teams of Canada and the United States. Canada's streak of eight straight (nine unofficial) world titles ended this past year with the Americans winning in a shoot-out. Each winning team receives and keeps a championship plate to symbolize their victory in women's hockey at its highest level.